At one time I thought my memory was rubbish because I come from a family of people with almost constant amnesia. However I realised today that my inability to remember names and appointments is inversely proportionate to how much I’m thinking about new material, what to have for tea or whether I should try selling a fictional murder pill on Twitter to gain notoriety. My memory is fine, I can remember lines or my jokes about willies. I just can’t cope with the mundane things in life. So if my memory is fine what does that make me? Thick I suppose. Perhaps my teachers were right when they told me I was stupid. Mathematics bamboozled as much back then as it does now. However I’ll resist the temptation to go into a hackneyed rant about its practical applications. That would be tantamount to a comedy set about aeroplane food, hey Janeane? The reason I’ve been thinking about my memory and consequently forgetting to breath, is because I have been trying to return a Blue-Ray disc to a friend for three days. Every night I’ve made sure it was placed underneath my door keys, so that I couldn’t possibly forget it and every morning I’ve woken up late, run into the shower, thought about a new podcast that I’m working on and practiced various silly voices. Then was unable to find my gloves, which I had to find, even though it was 10 degrees outside which reduced the likelihood of getting frostbite to zero. 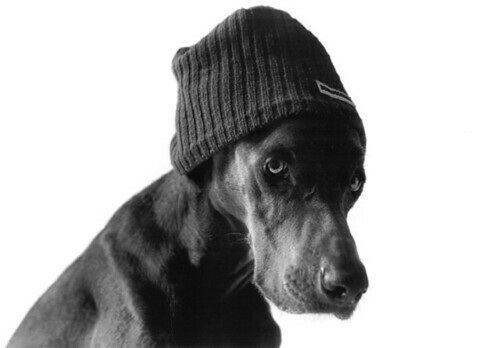 Here is a picture of a dog in a hat.